Flex is a slider that supports both image and video files. It also supports YouTube and Vimeo links. Click on SLIDES, go to the MAIN tab. Make sure your Slider Name matches the Slider Name on the Flex Container. The Slider Name is what connects your slides to the flex container. If you are including videos, choose your Video Source. You can choose to add videos from 'YouTube or Vimeo' or you can self-host a video (MP4 or OGG format). If you choose to include both YouTube/Vimeo videos and self-hosted videos, you will have to grab more slides from the Flex Folder (in the library) and then change the video source on the new slides to self-hosted. With Flex, you can have your Flex slides link to other pages. You can choose to have the link open in 'the same page' or 'a blank page' (a new page). Adding files is easy. Simply click 'Add File' beside the type of file that you want to upload for each slide. 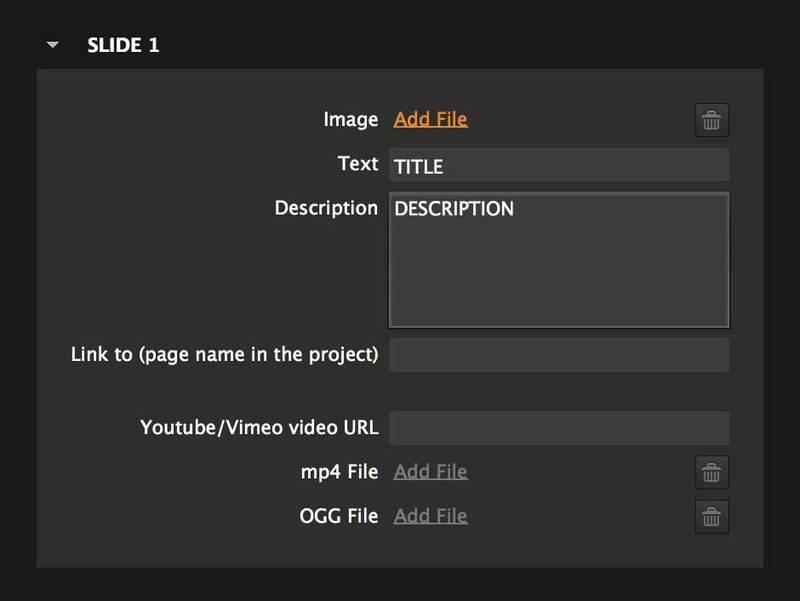 if your video is a YouTube or Vimeo file, you just need to include a link to your video. Flex allows you to have as many slides as you want. Each SLIDE allows you to add up to 20 image or video files. To get more slides, all you have to do is duplicate SLIDE, or you can grab another SLIDE from the Flex folder in the library. You can specify a title for your slide in the Text field and you can place your description in the field below it. If your description has multiple paragraphs, you need to make sure that when you place your paragraphs into the description box, get rid of any hard returns (or spaces) between your paragraphs.